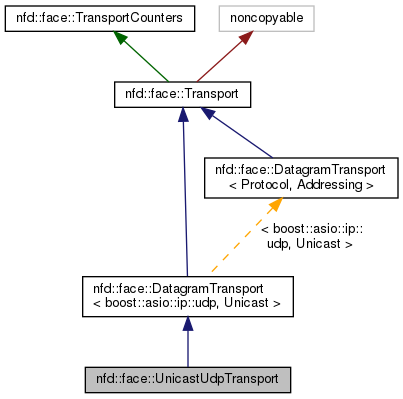 A Transport that communicates on a unicast UDP socket. Definition at line 40 of file unicast-udp-transport.hpp. Definition at line 41 of file unicast-udp-transport.cpp. References nfd::udp::computeMtu(), ndn::nfd::FACE_PERSISTENCY_ON_DEMAND, ndn::nfd::FACE_SCOPE_NON_LOCAL, nfd::face::Transport::getMtu(), nfd::face::Transport::getPersistency(), ndn::nfd::LINK_TYPE_POINT_TO_POINT, nfd::face::DatagramTransport< boost::asio::ip::udp, Unicast >::m_socket, nfd::face::Transport::MIN_MTU, NFD_LOG_FACE_INFO, NFD_LOG_FACE_WARN, nfd::face::Transport::setLinkType(), nfd::face::Transport::setLocalUri(), nfd::face::Transport::setMtu(), nfd::face::Transport::setPersistency(), nfd::face::Transport::setRemoteUri(), and nfd::face::Transport::setScope(). Base class implementation returns false. Definition at line 91 of file unicast-udp-transport.cpp. The base class implementation does nothing. When overridden in a subclass, the function should update internal states after persistency setting has been changed. Definition at line 97 of file unicast-udp-transport.cpp. References ndn::detail::ScopedCancelHandle::cancel(), ndn::nfd::FACE_PERSISTENCY_ON_DEMAND, nfd::face::Transport::getPersistency(), and nfd::face::Transport::setExpirationTime().